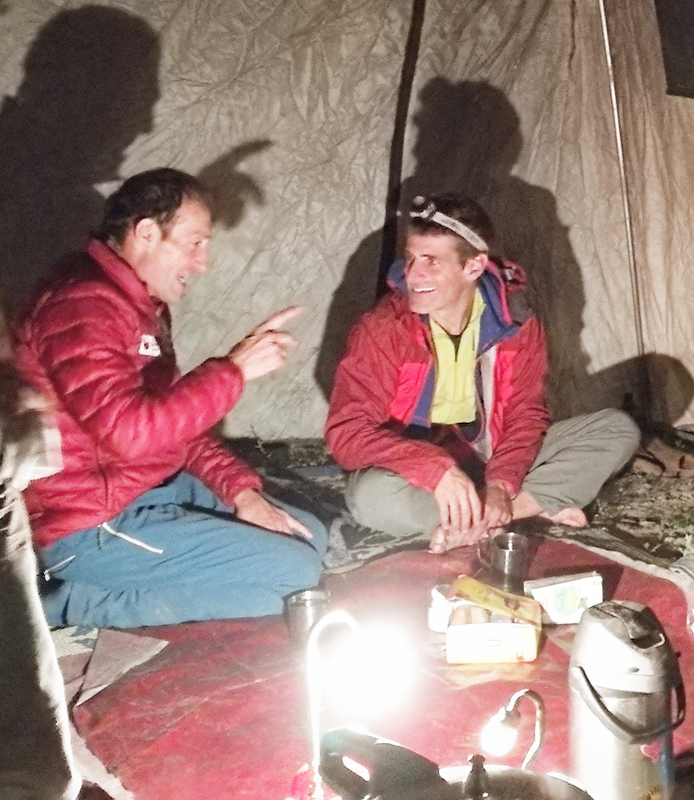 Mariano Galvan's family has arranged to continue searching for him and his climbing partner Alberto Zerain after the two went missing June 24 on Nanga Parbat's Mazeno Ridge. The official search was called off and the men are presumed dead after a helicopter reconnaissance on July 1 saw evidence of a massive slab avalanche where the men went missing. Mirza Ali, an owner and guide of Karakorum Expeditions, posted on Facebook July 6 that he and several others are helping with the continued search efforts. "I with my team members [am] heading to Nanga Parbat base camp with high hopes to trace the missing climbers on the Mazeno Ridge," he said. "The request was made by the family of Mr. Mariano Galvan from Argentina. I accepted the request to undertake the mission as part of our adventure diplomacy project.... My company Karakorum Expeditions has the ability and manpower to carry out such missions and with high hopes for good weather and positive thoughts to find the climbers. All the team members are from Shimshal village [Pakistan]." Meanwhile, a funeral was held for Zerain in his hometown of Vitoria-Gasteiz in the Basque region of Spain, on July 7. Inaki Makazaga, a Basque journalist and friend to Zerain, said that approximately 2,000 people attended the service. In Galvan's country, the focus is on a hope for a miraculous survival. "In Argentina, the family and friends of Mariano are not giving up and right now they are trying to get the funds [for] a [search and rescue] mission on foot," said Claudia Lopez, a Colorado-based climber and photographer who knew the men and had worked with them. "[This is an] enormous loss for our tribe. Phenomenal guys. Humble and visionary mountaineers." Marisol Galvan, Mariano's sister, posted on Facebook July 13 that she had received an update from Ali's rescue team that the weather was improving and that they planned to "go up again tomorrow." She had not responded to emails by press time. The two climbers were attempting the second ascent of the long, technical Mazeno Ridge, first completed to the summit of Nanga Parbat (8125m) in 2012 by a team of six, of which only two summited—Sandy Allan and Rick Allen. Allan later noted in the American Alpine Journal that he and Allen "would not have been in a position to make the top" without the support of their four partners. As a team of two, Galvan and Zerain were attempting the second ascent of the ridge in a lighter style. Galvan, 37, of Argentina, and Zerain, 55, of Spain's Basque region, had a wealth of experience in the Greater Ranges. Zerain had attempted a new variation to the then-uncompleted Mazeno Ridge in 2011 with Juan Carlos "Txingu" Arrieta, but they retreated early because of bad weather. The complete Mazeno Ridge of Nanga Parbat was undoubtedly one of the most famous unclimbed lines on the great peaks of the Karakoram/Himalaya, having been attempted many times, and by some of the world's greatest mountaineers. It is arguably the longest ridge on any of the 8000-meter peaks, variously quoted as 10 to 13 kilometers. The Mazeno has an approximate total elevation gain of 6500 meters, and it involves committing climbing around eight sub-peaks. It is so long—as Griffin explained in a July 2 report for TheBMC.co.uk—that teams must plan on being pinned down by storms for at least some of the time. No weather window is likely to last long enough for a complete ascent. According to Griffin's TheBMC.co.uk report, Galvan and Zerain started shuttling supplies to the base of the ridge on June 15. They launched their attempt June 18 and climbed more than 1000 meters on June 19 to about 5600 meters. There they waited out a storm until June 23. On that day, they moved up to around 6000 meters. By then, the climbers had reported wet snow and warm temperatures, which created more dangerous snow conditions. Zerain was carrying a GPS tracker that indicated movement to around 6270 meters over a six-hour period on June 24. "Yet about an hour later the tracker's position was 180 meters distant from this point and almost the same number of meters lower, at 6,112m," Griffin wrote. "For the next 15 hours the tracker sent a good signal from exactly the same location until it shut down." A helicopter search was delayed by storms until July 1. On that day, Griffin reported that "a helicopter was able to make two outings along the ridge in good visibility, reaching an altitude of 7,400 meters. Unfortunately, it was clearly seen that the location of the tracker was in an area of avalanche debris, [with] the trigger point [farther] up slope towards the crest of the ridge." Alex Gavan is a Romanian climber who knew Galvan and Zerain. 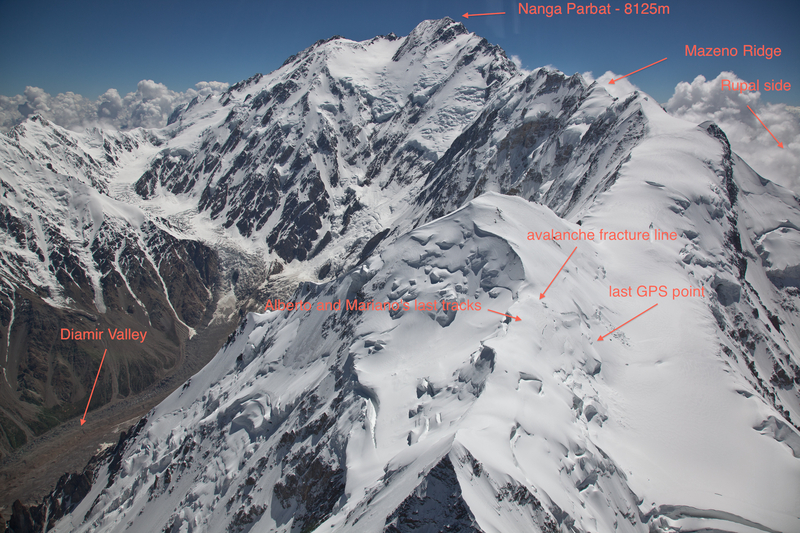 He was climbing the Kinshofer Route on Nanga Parbat when the two went missing, and he headed the primary searches from June 27 through July 1. He said he received a final message from Zerain on June 23 in which Zerain indicated that they were planning to descend to base camp once they reached "the col" higher on the ridge. Gavan sent a response to Zerain the next day. "For this last message I did not get a delivery confirmation like I usually do, but I didn't worry since I got used [to frequent] satellite network errors," Gavan wrote in a report that he shared with Alpinist. Gavan started making arrangements for a helicopter search when he still hadn't heard from the men on Mazeno Ridge by the evening of June 26. This would be the eighth helicopter search in the Himalaya that Gavan had either organized or participated in during his career (he doesn't count a mission on Annapurna in 2008 because his "role was a minor one" because of health reasons). Gavan said that the status of the Zerain and Galvan's insurance policies was not clear. "Because [these] financial detail[s] had to somehow be sorted out, even though the weather was good for flying on [June] 27th...the helicopter didn't fly...." he wrote. Finally, on July 1st, the weather was crystal clear and I was picked up by the helicopter from the base camp at 6 o'clock sharp. 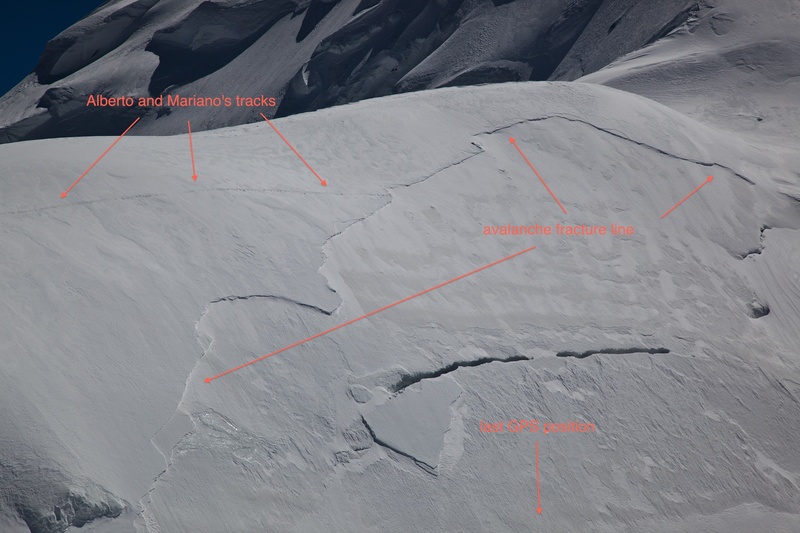 We soon reached the given GPS point and saw on that place precisely significant evidence of a massive slab avalanche: the fracture line, much debris and more disturbing, Alberto and Mariano's tracks abruptly ending on one part of the fracture line and not showing up again in any other place. Other than this, absolutely nothing to be seen of them. We went back to refuel and in the meantime I consulted with Alberto's wife and decided for one more search flight.... According to the RaceTracker device, Alberto and Marino [had only gone] uphill [on] the Mazeno, [and there were] no return tracks showing the intention of an early retreat from the climb.... In my mind everything got clearer and clearer. We extensively again searched this area, looked up the open crevasses, searched the nearby valleys, searched the Mazeno up to almost 7400 meters, much farther than they could have realistically climbed. The heli has [an] indicator, [and when it] is on the red line, the heli is going to crash. For parts of the flight, we were flying on the yellow line that is just under the red one, the impossible line. We went that far in our search. The pilots Abid and Azar, together with their copilots, were truly amazing professionals. It was not just another job for them, I felt them really engaged in finding Alberto and Mariano. They went wherever I suggested them to and at the same time they were coming up with their own useful ideas. Still nothing. The evidence found on the climbers' last known GPS point was much too heavy, much too hard to digest. But now everything was clear. It all finished back on June 24th but we could not have known this until now when we had the evidence. We flew a total of 6.5 hours of effective search, divided between the two helicopters, never both in the same time searching the same area. We double- and even triple-checked every square centimeter of the mountain. Still nothing. Alberto and Mariano were among the greats. Life is a gift. And those two amazing human beings did know how to cherish this gift by always looking for the good light. "I think every one of us should learn something from this story," Gavan said in a phone conversation July 13. He reiterated the ways in which communication could have been passed along more effectively to aid in the search, such as the GPS coordinates that he did not become aware of until after he and the helicopter crews had been searching other parts of the mountain, and he emphasized the importance of adequate insurance. After the search, Gavan decided not to continue his efforts to climb the Kinshofer Route. Even with six climbers, the first complete ascent of the Mazeno Ridge to the top of Nanga Parbat was an ordeal. After two weeks of climbing and waiting out storms, Sandy Allan and Rick Allen finally summited. Their teammates Cathy O'Dowd, Lhakpa Nuru, Lhakpa Rangdu, and Lhakpa Zarok reached a high point beyond the Mazeno Gap, but they turned around as the expedition's supplies ran low. Along the way, members of the group experienced several near misses—including avalanches and big falls. Allan noted in the American Alpine Journal that he and Allen "would not have been in a position to make the top" without the support of their four partners. Prior to Sandy Allan and Rick Allen's successful 2012 expedition, nine teams had attempted the line since 1979. Doug Chabot and Steve Swenson had reached the Mazeno Gap—were the ridge abuts the main peak—in 2004, but they were too depleted to carry on, and they descended the Schell Route. They gave their climb a rating of VI M4 AI3. Two Germans, Joseph Lunger and Luis Stitzinger were the second team to reach the same point in 2008 and that was as far as anyone got until 2012, when Allan and Allen both succeeded on their second attempts since 1992 and 1995, respectively. Other talented alpinists who have tried the route include Doug Scott (three attempts), Voytek Kurtyka, Andrew Lock, Erhard Loretan, Jean Troillet, Claude-Alain Gailland and Frederic Roux. According to the Spanish website Desnivel.com, Galvan "worked as a mountain guide, mainly in the Aconcagua area, and he lived a very simple life (he had no house or car) to save as much money as he could to go on expeditions to the Himalayas." The website for Aconcagua Mountain Guides described Galvan as one of its best guides and noted that he had soloed Aconcagua's risky south face (6961m) "in just over a day," had helped open new routes on the peak. Griffin reported that Galvan had climbed seven 8000-meter peaks without bottled oxygen. Galvan's Facebook page was converted to a memorial page by July 3. One of his posts from June 9, translated to English, reads: "Again I prepare for my next challenge.... It is not my style to boast about what I can or can't do.... I am not interested in being the first Argentine to climb this or that peak; that is not what moves me... Parbat is a mountain that must be respected.... The best thing is to study it on all sides and see what's the best strategy.... Once again I approach this project as I have for six years: with the help of family, friends, acquaintances and 100 percent financed out of my own pocket, without the help of governments, sports secretaries, companies, etc...."
Desnivel.com reported that Galvan was "heavily influenced" by the history of Polish mountaineering, with its stories of climbers getting by with the limited equipment they had access to while enduring severe cold and suffering. Zerain earned a living as a truck driver and had climbed Everest and K2, among several other 8000-meter peaks, without bottled oxygen. He wrote a blog during his 2011 attempt on the Mazeno Ridge with Juan Carlos "Txingu" Arrieta. "We are aware of the difficult challenge that awaits us in Pakistani lands," he wrote in Spanish, "but the vision and motivation that drives us to pursue this dream is superior to any other inconvenience.... We do not know with what conditions or with what difficulties we will find ourselves, it is therefore a terrain of adventure where we will have to let our instincts guide us." Zerain leaves behind a wife and two grown sons. In 2008 he narrowly missed being involved in the disaster on K2's Abruzzi Ridge in which 11 people died in two days; after helping to fix ropes through the crux section of the Bottleneck, he had summited and descended before the huge serac above the Bottleneck collapsed. [The story is covered in detail in the K2 Mountain Profile in Alpinist 38.—Ed.] Following his K2 expedition, Zerain told Graham Bowley in 2010 that he had made a point to stay home more while his children were young. 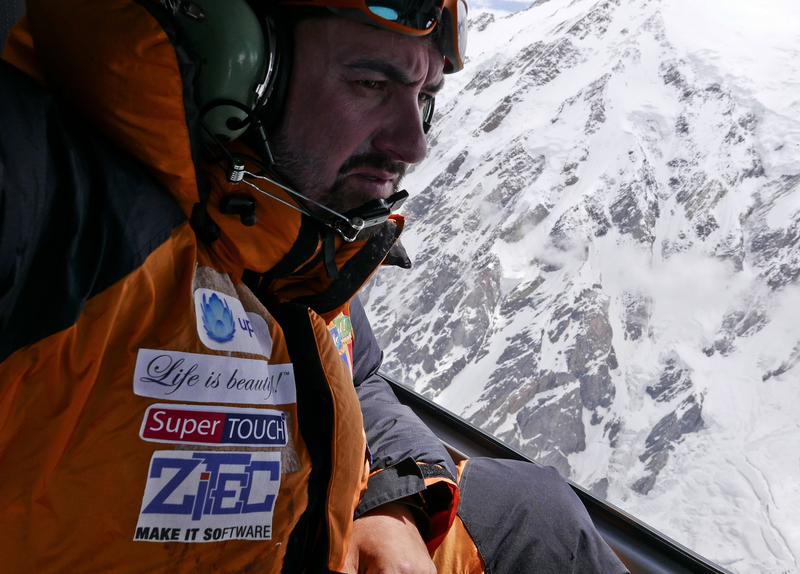 This morning we received the news that we all imagined but none wanted to accept: an avalanche has taken Alberto Zerain and Mariano Galvan as they ascended the Mazeno Ridge of Nanga Parbat. With them we lost two great mountaineers and, above all, two very good people: simple, close, discrete. Such were Mariano and Alberto.